Short for Applicability Statement 2, AS2 is a standard used to securely send and receive files over the Internet. The messages are built using S/MIME format and can be compressed, signed, and encrypted. They are then sent over an HTTPS encrypted tunnel, making this method of transferring files very secure. This standard also implements Message Disposition Notifications (also known as MDNs or receipts) to guarantee the successful delivery of the message. How is it used in GoAnywhere? 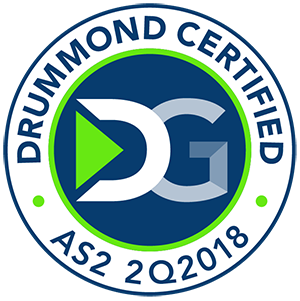 GoAnywhere MFT is Drummond Certified. This provides a high degree of security assurance and offers compatibility with other applications that send AS2 file transfers. Use GoAnywhere’s built-in SSL certificate manager to define AS2 server certificates. Trading partner certificates can be imported into the product, making it easy to verify the authenticity of your senders. Dual-factor authentication using passwords and SSL certificates is also supported if you need additional server security. GoAnywhere offers users full audit capabilities. Use its auditing and reporting features to track all AS2 activity, including who sends a message, what encryption algorithm they used, the Message Integrity Check, whether the message was digitally signed, and more. In addition, once the message is received, GoAnywhere can automatically reply to senders with an MDN receipt. Otherwise, the product can be configured to require manual verification of messages before receipts are processed. Learn how AS2 file transfers work in GoAnywhere MFT. Request a quote to provide an AS2 server using GoAnywhere MFT.